Pálmi Sigurhjartarson is an acclaimed songwriter and pianist and Sjonni often joked that Pálmi must have eleven fingers instead of ten because he admired his piano playing so much. His music career started at the age of eighteen playing piano bars in Reykjavik and music has been his main profession ever since. 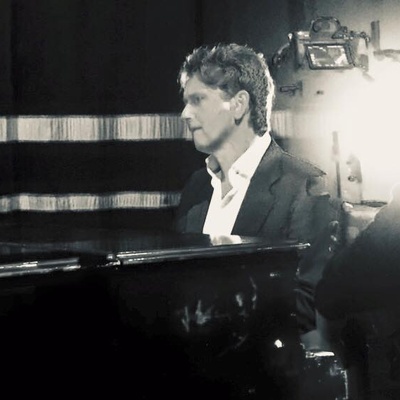 He’s had a versatile career, working with solo artists, playing with big orchestras and classical singers, directing music for over 150 TV and Radio shows and writing many hit popsongs. Sjonni and Pálmi were close friends for years, worked together in numerous shows in the theatre and with different bands, such as Rokk and the Flavors and also performed as a duo on various occations. Even though this is Palmi’s first time in the Eurovision song contest, he is the main pianist of many of Iceland’s former contestants, such as Hera Björk, Yohanna, Regina Ósk and Selma. Pálmi has directed and performed music for theatregroups in Iceland and is now the musical director of the highly acclaimed Icelandic Theatre Group Vesturport who were recently awarded the prestigious Europian Theatre Prize. Vesturport productions have travelled all over the world and in the year 2008 Palmi was the musical director and performed in one of their projects at the Lyric Hammersmith Theatre in London. Pálmi is a family man and just had a baby, his third son. Just for fun, Pálmi doesn’t eat butter and is sure that Benni, the drummer in Sjonni’s Friends, is also a professional footballplayer for Manchester United….well, he is pretty sure. Prize. Vesturport productions have travelled all over the world and in the year 2008 Palmi worked as a performer and musical director on one of their projects in the Lyric Hammersmith Theatre in London.